A recognizable tradition in sports, at all levels and in all leagues, is the retiring of jersey numbers. The Toronto Maple Leafs were the first professional sports team to retire a number, the No. 6 of Ace Bailey in 1934. There are no league-wide criteria for retiring a number, though this honor is usually bestowed upon a player who has retired or died. Choosing which players receive this honor is in the hands of each individual team’s ownership and management personnel. Some teams, like the 1934 to 2016 Maple Leafs franchise, chose only to retire numbers of players who have experienced career-ending incidents while playing for the team. Other teams retire numbers for commemorative purposes, like the Minnesota Wild retiring No. 1 in dedication to their fans and the Vegas Golden Knights retiring No. 58 as a memorial to the victims of the 2017 Las Vegas shooting. The Pittsburgh Penguins have two such models for retiring numbers – the No. 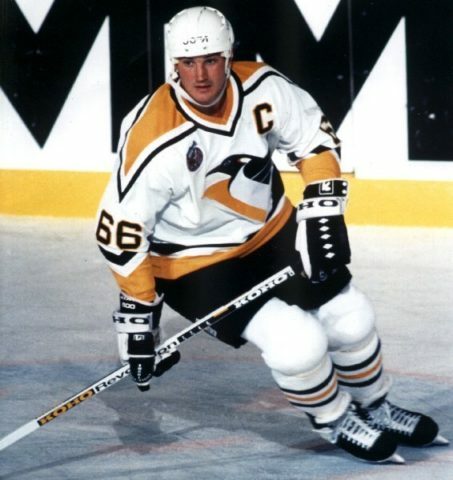 66 of Mario Lemieux and the No. 21 of Michel Briere – though the circumstances surrounding their honors differ. Lemieux’s No. 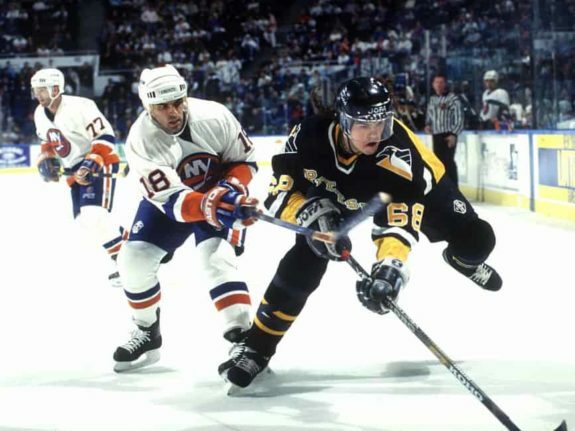 66 was the first number retired by the Penguins, which they did on Nov. 19, 1997. Named one of the NHL’s 100 Greatest Players in 2017, Lemieux chose to retire at the end of the 1996-97 season, following a string of health issues that included a fight against cancer and multiple back surgeries. His performance in the first 12 seasons of his career alone was enough to earn him induction into the Hockey Hall of Fame and the distinction of a retired number. He was captain of the first two Stanley Cup-winning teams in franchise history, scored on his first shot in his first shift of his first game in the league and earned a host NHL awards, including the Calder Memorial Trophy, Conn Smythe Trophy, Art Ross Trophy, Ted Lindsay/Lester B. Pearson Award, Hart Memorial Trophy, NHL Plus/Minus Award and Bill Masterton Memorial Trophy. As if those accolades weren’t enough proof that Lemieux earned the honor of having his number retired, his off-ice miracles and the final five seasons of his career added to the list of reasons. In Sep. 1999, Lemieux bought the Penguins franchise out of bankruptcy, making the first move to solidify the team’s permanent stay in Pittsburgh. Just over a year later, he came out of retirement to be the first player-owner in the modern NHL era. He permanently retired from playing during the 2005-06 season and his jersey was returned to the rafters at Mellon Arena. Lemieux ranks as the seventh all-time point scorer in NHL history, eighth all-time goal scorer and 10th all-time assist producer. He holds many Penguins franchise records, including those for career goals, points, assists and shots. He was the second-fastest player in league history to hit the 1,000th career point marker and the 500th goal plateau, and he had six 50-goal seasons and hit the 100-point mark in 10 seasons in his career. Unlike Wayne Gretzky’s No. 99, Lemieux’s 66 is not retired league-wide, though it is retired for Team Canada and the Laval Titan of the Quebec Major Junior Hockey League. New York Islanders forward Joshua Ho-Sang caused a media stir in 2017 when he chose to wear No. 66 in his rookie season. Ho-Sang said he chose the number as a tribute to Lemieux, who he said is “a man worth looking up to.” Lemieux, himself, did not have a problem with Ho-Sang’s choice. In contrast to Lemieux’s long and productive career, Briere played in just 76 games for his career, all in 1969-70. A third round draft pick of the Penguins in the 1969 NHL Amateur Draft, Briere scored 44 points in his first season and earned the team’s Rookie of the Year award. He scored the first overtime goal in franchise history on Apr. 12, 1970 with the game-winning, series-clinching tally to sweep the Oakland Seals in the playoff quarterfinals to take the franchise’s first playoff series victory. He ended the postseason with eight points: five goals and three assists. On May 15, 1970, Briere was involved in a single-car automobile accident in Quebec. He suffered major head trauma and was given a 50 percent chance of recovery and survival. He spent 11 months in a coma before his death on April 13, 1971, just nine days after the Penguins finished the 1970-71 season and missed the playoffs. His funeral was held outside Montreal and a memorial service also took place in Pittsburgh. The QMJHL renamed its MVP award after Briere in 1972 and the Penguins named their Rookie of the Year award in his honor as well. However, Briere’s number was not initially retired by the Penguins organization. A photo of he and his framed jersey hung in the Igloo Club at the old Mellon Arena as a memorial and No. 21 was not issued after the 1969-70 season. But it wasn’t until Jan. 5, 2001 that Briere’s number was officially retired and hung in the rafters, making him the second player in franchise history to receive this honor. “Given a proper ‘mourning’ period [out of respect for retired or deceased players], a number should be put back into circulation… It’s just a number… Numbers are not sacred. Memories are, and they should be enough,” (from ‘Retiring Jersey Numbers has Become Ridiculous’ – Chicago Tribune – 5/15/17). Knowles’ argument has some validity and was even corroborated by Lemieux’s comments in the Ho-Sang incident. The Montreal Canadiens, for example, have retired 14 numbers, the most in the NHL, in addition to the league-wide retirement of No. 99. However, that still leaves 85 numbers from which to choose, so running out of viable one and two-digit numbers is not a concern, yet. PPG Paints Arena, unlike Bell Center, has plenty of room in the rafters. The following five players, based on their performances in the NHL thus far, could be the next wave of Penguins to have their numbers retired. Though Marc-Andre Fleury will likely spend the rest of his career with the Vegas Golden Knights, his 13 seasons in Pittsburgh are not easily forgotten. In addition to three Stanley Cups (2009, 2016, 2017), Fleury holds the Penguins records for most wins, most shots faced, most saves, most games played by a goalie, best goals-against-average and most shutouts. In fact, the only franchise goalie statistic in which Fleury does not top the list is in save percentage, where he is second to Matt Murray. Their numbers are separated by just .003 of a percent. A former Penguins MVP in 2011, Fleury is third on the NHL’s all-time shootout wins list with 55. He is four wins behind Ryan Miller of the Anaheim Ducks and six behind Henrik Lundqvist of the New York Rangers. Marc-Andre Fleury makes a save against the Columbus Blue Jackets (Charles LeClaire-USA TODAY Sports). In addition to quantifiable statistics, Fleury was a fan favorite in Pittsburgh and a fun-loving presence in the locker room. It’s unclear if these types of personal qualities factor into the decision-making process when choosing to retire a number, but if so, they push Fleury near the top of the list. For some, it’s hard to imagine Kris Letang and retired number appearing in the same sentence. His on-ice performance took a nosedive after a few seasons plagued with health problems and injuries, but he has rebounded in 2018-19. As a defenseman, it’s more difficult to compare Letang’s statistics to those of other Penguins in contention for having their numbers retired because his primary job is to prevent goals, not score them. However, he is skilled at doing both. In the post-2004-05 lockout era, offensive defensemen are in-demand, and Letang fits that bill. In addition to being a three-time Stanley Cup winner (2009, 2016, 2017), he cracks the top-10 in four franchise leaderboards: seventh in career games played, sixth in career assists, 10th in career points and seventh in career shots. Only three other defensemen, Brooks Orpik, Paul Coffey and Ron Stackhouse, are on all three lists, and Letang slots higher than any of them. 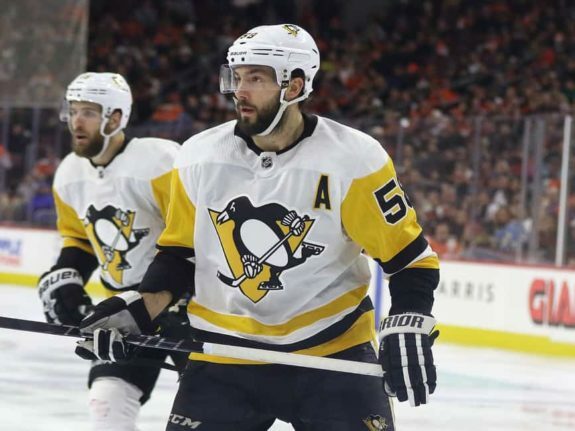 Though Letang was a recipient of the Penguins’ Michel Briere Rookie of the Year award in 2008, is a two-time winner of the team’s Defensive Player of the Year award and a five-time Norris Trophy nominee, he is still the most far-fetched pick on the list. Assuming he finishes out his career with the Penguins, his future performance will influence his candidacy for having his number retired. Related: Is Kris Letang Elite? Jaromir Jagr is the most controversial name on the list and the one which will draw up questions about what criteria to use when choosing to retire a player’s number. His on-ice performance made him one of the Penguins’ most prominent stars of the 1990s, second only to Lemieux. A key factor in the Penguins’ first two Stanley Cups (1991, 1992), Jagr won five Art Ross Trophies, two Ted Lindsay/Lester B. Pearson Awards and the Hart Memorial Trophy during his time in Pittsburgh. On the franchise leaderboards, he is second in career goals and third in career assists, points and shots. 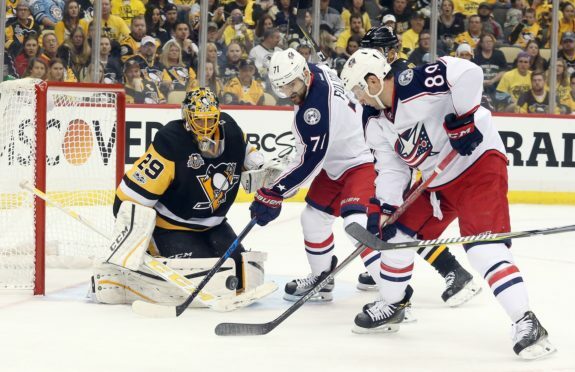 If those statistics aren’t enough to prove his abilities, he became the sixth-youngest player to hit the 1000th point marker in 2000-01 while with the Penguins and he had two 50-goal seasons and four 100-point seasons during his time in Pittsburgh. If Fleury’s fan-friendly attitude gives him extra points toward having his number retired, Jagr’s oftentimes arrogant, self-centered attitude could be a deterrent. Pittsburgh fans are still bitter about his exit from the city in 2001 when he asked to be traded and seemingly turned his back on the struggling franchise for more money with the Washington Capitals. Jagr did make the Trib Total Media All-Time Team – a collection of the 15 greatest players in Penguins history as voted on by fans and a panel of media and team officials – in 2010, perhaps signaling that the sting of his departure has lessened over time. Though Jagr is playing for HC Kladno of the Czech Republic this season, he has not officially retired from the NHL and has not ruled out a comeback. At 46, it’s not likely Jagr will return to the NHL for anything more than a one-day deal to formally retire, but anything is possible. Until then, discussions of retiring his number are futile. 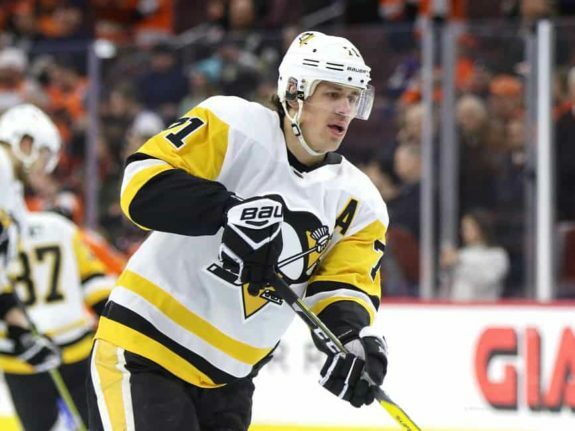 Evgeni Malkin might play second fiddle to Sidney Crosby on many occasions, but that doesn’t diminish his personal accomplishments. A three-time Stanley Cup champion (2009, 2016, 2017), two-time Art Ross Trophy winner, a Calder Memorial Trophy and Ted Lindsay/Lester B. Pearson Award recipient, there aren’t many things Malkin can’t do. He has one 50-goal season, in 2011-12, and three 100-point seasons so far in his career. He was the first player since 1917-18 to score goals in each of his first six NHL games and the first Russian player to win the Conn Smythe Trophy, which he did in 2009. One milestone Malkin has not yet reached is the 500-goal plateau. However, it is not out of reach before the end of his career. At age 32, he could have approximately eight to 10 years left in the league, meaning he would need about 15 goals per season to hit that mark. In his lowest-scoring full season, 2010-11, Malkin scored exactly 15 goals. Malkin has already proven he’s a key piece of the Penguins puzzle, even amid rumors that all isn’t well among himself, Phil Kessel and coach Mike Sullivan. Penguins fans hope the alleged feud won’t lead to a trade request from the Russian star. However, unlike Letang, if Malkin is traded, the move would likely not affect his candidacy to have his number retired in Pittsburgh, as he has already proven he’s one of the team’s best players of the late 2000s and 2010s. The question of the Penguins retiring Sidney Crosby’s number is not if it will happen, but when. He is the most obvious choice of current Penguins to have his number retired, proven by his oft comparison to both Lemieux and Gretzky, and his status as the face of the franchise since 2005. As a tangible proof of Crosby’s success, he has three Stanley Cups (2009, 2016, 2017) on his record, two Art Ross Trophies, two Hart Memorial Trophies, three Ted Lindsay/Lester B. Pearson Awards, two Maurice ‘Rocket’ Richard Trophies and two Conn Smythe Trophies. These league awards complement Crosby’s Michel Briere Rookie of the Year award, seven Penguins MVP awards, five Penguins Booster Club awards, three Aldege “Baz” Bastien Memorial Good Guy awards, three Edward J. DeBartolo Community Service Awards and one Penguins Player’s Player award. Sidney Crosby (Charles LeClaire-USA TODAY Sports). Crosby is more than his awards, however. He likes to hit milestones, and he hit many of them early in his career. He was the youngest player to record 100 points in a season, 200 points in a career, two consecutive 100-point seasons, lead the NHL playoffs in scoring, be named a First-Team All-Star, be voted to the All-Star Game starting lineup and captain a Stanley Cup team. Like Malkin, Crosby has not hit the 500-goal marker yet, sitting at 428 as of Dec. 31, 2018. At age 31, if he plays approximately eight to 10 more seasons, he would need to score just nine goals each season to hit the plateau. In his lowest scoring season, 2012-13, he scored 15 goals. As of Dec. 31, 2018, Crosby is also second on most Penguins franchise leaderboards, including career games played, assists, points and shots. He is also third on the franchise career goals leaderboard, behind Lemieux and Jagr. Crosby hit the 1,000th point marker on Feb. 16, 2017 in a win over the Winnipeg Jets. He was the ninth-youngest player to reach the milestone. He has also has one 50-goal season and five 100-point seasons in his career. 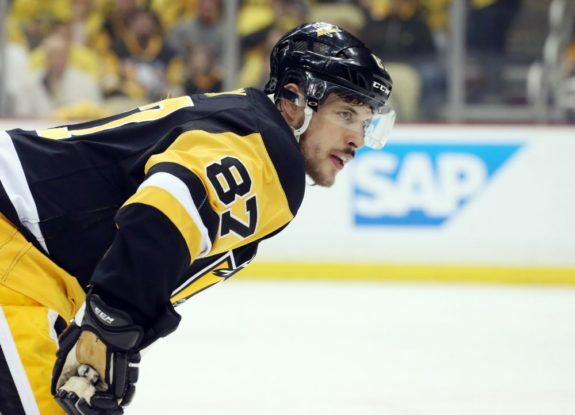 Crosby continues to impress from game to game and season to season, and barring an unforeseen problem, he will stay a Penguin through the rest of his career, solidifying his retired number potential. Picking future number retirees is difficult, even with indisputable proof like statistics. Often, players who have longer stints with specific clubs or very short stints ended by unforeseen circumstances are more likely to have their numbers retired than those who pass in and out of a program. For this reason, doing a full-scale calculation of “the best” players is nearly impossible without employing some higher level math and factoring in how the style of the game changes over the years. These five players might be the most-likely Penguins to have their numbers retired, but they are not the only possible candidates from the last 20 to 30 years.